When a family member has committed the most terrible crime imaginable, the family left behind often has to deal with the consequences of their actions. Usually these family members have some measure of anonymity when in public, but when the perpetrator is your identical twin sister, there is literally no escape from people’s reactions. This is the case for Alice, who hasn’t been able to find ‘redemption’ since her sister took a gun to school three years ago and killed seven innocent kids. Seeing her face in the streets is enough to elicit disgust, wrath and pain, even though everybody knows that it was the other sister that did the crime. Even Alice’s dad has trouble looking at her, only adding to Alice’s eventual breakdown and stint in an institution. Wearing the face of a killer is bad enough, but Alice also harbours concerns that she will end up just as ‘evil’ and ‘dangerous’ as her sister was, especially considering they share the same DNA. Three years on, and the small outback town of Collector has not forgotten its young victims. After a lengthy stay at Merryview, getting treatment for self-harming and psychological issues, Alice is back at the school where everything went so wrong. But she is still struggling to find her place, and finds it difficult to cope with the hatred thrown her way, despite the time that has passed. One day, as she walks alone along the old highway, she thinks she sees an apparition of her sister (who turned the gun on herself after shooting the other kids) and approaches it. After making contact, Alice finds herself in a twisted dreamscape version of her small town- a parallel world that is made up of the nightmares of everyone in the Collector community. This is a broken place, where everything is unusual yet familiar, and monsters hunt down lost children. She meets versions of townspeople she knows, who were dreamt up by others and are trying to survive the nightmare world they have been thrown into. She also meets an immortal named Lux and his best friend Ivan, whose missions in life are to kill and destroy the ‘school-girl monsters’- girls in school dresses with guns who kill everybody in the dreamscape world, and who only began appearing three years earlier. Believing that Alice is one of the monsters, and that she plays a part in an important prophecy, Ivan and Lux bide their time and attempt to befriend Alice (who goes by the name of Kell in this world) and her ragtag gang. But, unaware of who she truly is, they soon start to realise that Alice is quite different from the other school-girl monsters, and that there are more secrets that revolve around that day three years ago than they had believed. With lives at risk and hatred running rampant, will Alice be able to return back home? Will Lux and Ivan be able to fulfil their prophecy? And will all the terrible secrets from that day finally be revealed? When I first read the blurb for this novel, I was intrigued by the unique twin-killer storyline- imagine someone who looks exactly like you committing a crime and then you having to deal with the subsequent backlash, even though you’re essentially innocent. Imagine the prejudice and hatred you would face, for something that you didn’t even do! What I didn’t realise, however, was that this book shifts between the real world and a dreamscape world, and features mysterious elements. While this was slightly unexpected (I obviously didn’t read the blurb carefully enough the first time), this only made the focus of the story more interesting, and added to the depth of each character. Narrated by Alice and Lux, chapter by chapter, readers are able to learn about the murders that Alice’s sister (who is never named) committed, and the repercussions for all involved. 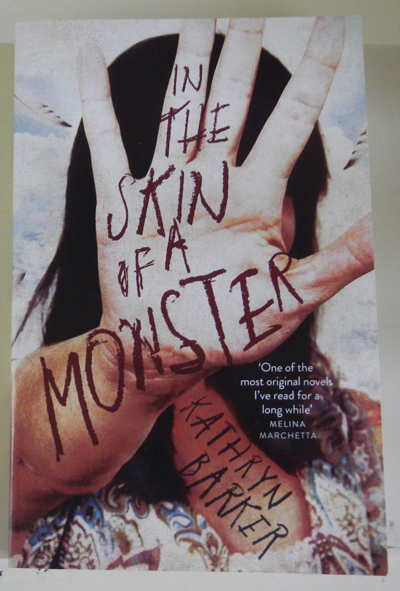 This book is set in outback Australia, and as I was reading it, I was able to conjure up images of a post-apocalyptic Mad Max world, with traces of The Maze Runner thrown in for good measure. It’s a strange mix to be certain, and probably not a very good indicator of how well-written the book actually is, but that’s the imagery that came to mind while reading this novel. Considering the content, this debut novel is probably better for more mature readers, but many younger people could also benefit from Alice’s insights into a dark and confusing world where nothing is really as it seems. Wow, that sounds really different and intriguing.